Yesterday, in the 30XL30D challenge, we used the INDEX function to return a value or reference, based on a row and/or column number. For day 25 in the challenge, we'll examine the REPLACE function, which is in the Text category. It replaces a specified number of characters in a text string, with new text. So, let's take a look at the REPLACE information and examples, and if you have other tips or examples, please share them in the comments. 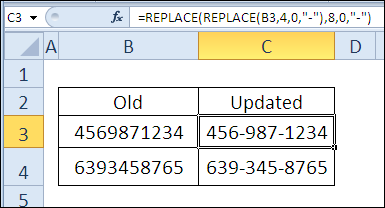 The REPLACE function replaces characters within text, based on the number of characters, and starting position, specified. How Could You Use REPLACE? old_text is the text string in which characters will be replaced. The REPLACE function replaces a specified number of characters at the indicated starting position. To replace a specific text string, anywhere in the original text, you can use the SUBSTITUTE function, which we'll see later in the challenge. With the REPLACE function, you can change the first three digits in a phone number, when a new area code is introduced. 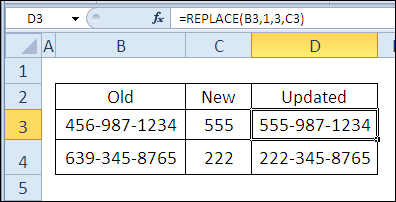 In this example, the new area code is entered in column C, and the revised phone numbers are shown in column D.
To identify the starting position for the REPLACE function, you can use the FIND function, to locate a specific text string or character. In this example, we want to replace the first space character with a colon and space character. 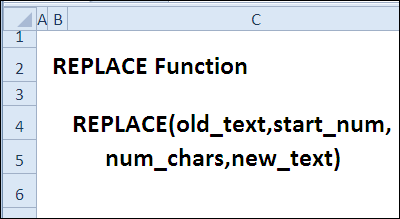 The REPLACE function can be nested, so multiple replacements are made in the old text string. In this example, the list of phone numbers needs to have hyphens inserted, after the first 3 numbers, and after the second 3 numbers. By using zero as the number of characters to replace, none of the numbers will be removed, and hyphens will be inserted. 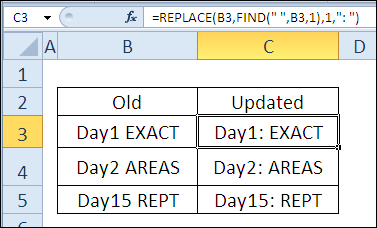 To see the formulas used in today's examples, you can download the REPLACE function sample workbook. The file is zipped, and is in Excel 2007 file format. 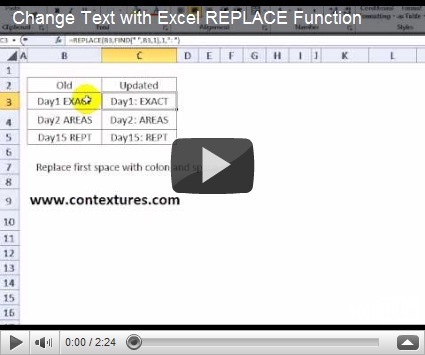 To see a demonstration of the examples in the REPLACE function sample workbook, you can watch this short Excel video tutorial. I assumed all dates were no older than 2000.